The Myth of Sisyphus has always stuck in my head. In the story, as punishment for a crime (apparently his crime differs in various versions of the story), Sisyphus is condemned by the gods to an eternity of labor. His task is to push a boulder up to the top of a mountain, knowing that each time he reaches the top, the boulder will come tumbling down and he will have to start again. This is his task for all eternity. Heavy labor which serves no purpose; endless, exhausting, meaningless work. Work he knows is meaningless. "The struggle itself toward the heights is enough to fill a man's heart. One must imagine Sisyphus happy." For Camus, "the absurd" is "the divorce between the actor and his setting." We find ourselves as beings who desire meaning and purpose, only to be put in a world in which meaning seems absent. We live. We die, and seemingly enter an eternity of non-being. Anything beyond that is a hope, not knowledge. All the things we create and accomplish seem to go for naught. Our work, our lives, seem meaningless in light of our fate. "...in a universe suddenly divested of illusion and lights, man feels an alien, a stranger. His exile is without remedy since he is deprived of the memory of a lost home or the hope of a promised land. This divorce between man and his life, the actor and his setting, is properly the feeling of absurdity." "The absurd is born of this confrontation between human need and the unreasonable silence of the world." "The absurd is essentially a divorce. It lies in neither of the elements compared; it is born of their confrontation." 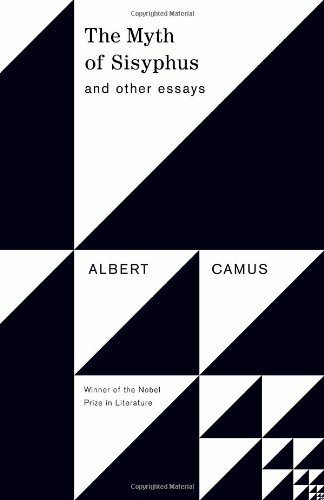 Camus' essay is an exploration of whether intellectually accepting that life is absurd should logically lead to suicide or not. In the end Camus rejects suicide as the logical conclusion of the absurd. Part of the reason that Camus rejects suicide is that he doesn't think the absurd should be solved. For Camus, to resolve the problem in any way doesn't do justice to the true nature of life. We must look absurdity straight in the face and embrace it. We must be happy Sisyphi. In the course of his essay, Camus interacts with other philosophers who "solve" absurdity in some way. One example is Soren Kierkegaard who, in the end, appeals to God as a solution to the absurd. It is not for me to wonder to what stirring preaching this attitude is linked. I merely have to wonder if the spectacle of the absurd and its own character justifies it. On this point, I know that it is not so. Upon considering again the content of the absurd, one understands better the method that inspired Kierkegaard. Between the irrational of the world and the insurgent nostalgia of the absurd, he does not maintain the equilibrium. He does not respect the relationship that constitutes, properly speaking, the feeling of absurdity. Sure of being unable to escape the irrational, he wants at least to save himself from that desperate nostalgia that seems to him sterile and devoid of implication. But if he may be right on this point in his judgment, he could not be in his negation. If he substitutes for his cry of revolt a frantic adherence, at once he is led to blind himself to the absurd which hitherto enlightened him and to deify the only certainty he henceforth possesses, the irrational. The important things, as Abbe Galiani said to Mme d'Epinay, is not to be cured, but to live with one's ailments. Kierkegaard wants to be cured. To be cured is his frenzied wish, and it runs throughout his whole journal. The entire effort of his intelligence is to escape the antinomy of the human condition." For Kierkegaard, God solves the absurd, either simply because He willed our existence or because He makes possible a better future (i.e. Heaven) – a future which retrospectively makes sense of the present. "Vanity of vanities, says the Preacher, vanity of vanities! All is vanity. What does man gain by all the toil at which he toils under the sun? A generation goes, and a generation comes, but the earth remains forever... There is no remembrance of former things, nor will there be any remembrance of later things yet to be among those who come after." "I hated all my toil in which I toil under the sun, seeing that I must leave it to the man who will come after me, and who knows whether he will be wise or a fool? Yet he will be master of all for which I toiled and used my wisdom under the sun. This is also vanity. So I turned about and gave my heart up to despair over all the toil of my labors under the sun...What has a man from all the toil and striving of heart with which he toils beneath the sun? For all his days are full of sorrow, and his work is a vexation. Even in the night his heart does not rest. This also is vanity." "But all this I laid to heart, examining it all, how the righteous and the wise and their deeds are in the hands of God. Whether it is love or hate, man does not know; both are before him. It is the same for all, since the same event (death) happens to the righteous and the wicked, the good and the evil, to the clean and the unclean, to him who sacrifices and him who does not sacrifice. As the good one is, so is the sinner, and he who swears as he who shuns an oath. This is an evil in all that is done under the sun, that same event happens to all. Also, the hearts of the children of man are full of evil, and madness is in their hearts while they live, and after that they go to the dead. But he who is joined with all the living has hope, for a living dog is better than a dead lion. For the living know that they will die, but the dead know nothing, and they have no more reward, for the memory of them is forgotten. Their love and their hate and their envy have already perished, and forever they have no more share in all that is done under the sun." "The end of the matter; all has been heard. Fear God and keep his commandments, for this is the whole duty of man. For God will bring every deed into judgment, with every secret thing, whether good or evil." Even though he doesn't have a firm eschatology to speak of (although he may be alluding to the hope of a final judgment), he solves the absurd by appealing to our duty to God. For the writer, this is what gives our life meaning. It is what we are here for. Camus sees this as a cop-out, a turning away from the true nature of life. I just don't. I agree with Camus that, without appealing to some type of meaning giver, or some final eschatological solution, life remains absurd. We hunger for meaning, we want the things we do to be important in some way, but, in the end, we return to dust. On that view, it will not matter whether we were ever alive or not. Ultimately nothing will have mattered. But I disagree with Camus in that I don't think it's a cop out to look for, and ultimately embrace, an intellectual solution to the absurd. Accepting the absurd is depressing as hell. And so I appeal to God. Along with Kierkegaard and The Preacher, I hope that this will all somehow all make sense in the end. That there is something more to existence than a meaningless life and then an eternity of nothingness. That God is somehow both the Creator and the Redeemer of life. I don't know what that might look like, and the different religions all have different conceptions of how it will be in the end. But living with that faith gives me hope, and it allows me to find meaning in life as it is. "...ultimate meaning necessarily exceeds and surpasses the finite intellectual capacities of man... What is demanded of man is not, as some existential philosophers teach, to endure the meaninglessness of life, but rather to bear his incapacity to grasp its unconditional meaningfulness in rational terms. Logos is deeper than logic." We don't know what the ultimate meaning of life is. But the hope that there is one is a hope that can keep me going. Maybe there are some out there who can be happy Sisyphi, but I can't push a rock up a hill without the hope that it's for some greater purpose.